This is based on the Jack Skellington Wreath I made last year. Using a 25 cm ring as a base I made a covering strip using green acrylic DK yarn, 80 rows of 21 stitches worked on a 4.25 mm hook. You need to pull it slightly when sewing it over the ring but it gives good coverage without gaps at the outer edge or gathers at the inner. Took me less than 2 hours to crochet the strip and sew it on. I wasn’t sure originally how I was going to decorate it (which is probably why it took me so long to finish it) in some ways there are too many sources of inspiration out there. Bow – will add this sometime later this week. 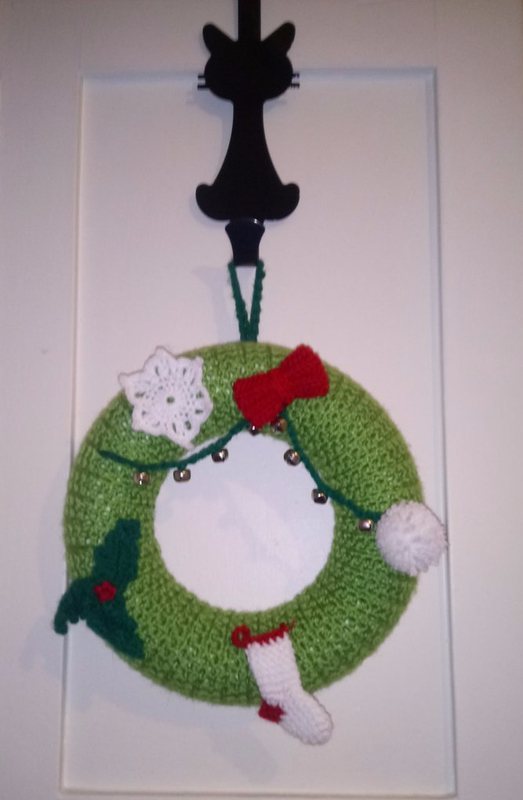 The Bell Garland is simply a crocheted chain. I cut a long length of yarn to start with, then threaded the on the bells before crocheting. The bells were incorporated into every 5th chain. The Snowball is simply a pompom. I use a fork type; it is very quick and easy to use.